On our return trip from Amalfi Coast to Naples, we were ahead of our itinerary and decided to stop by Pompeii since it was sort of along the path from Sorrento. Pompeii is about a 30 minute drive away from Naples. 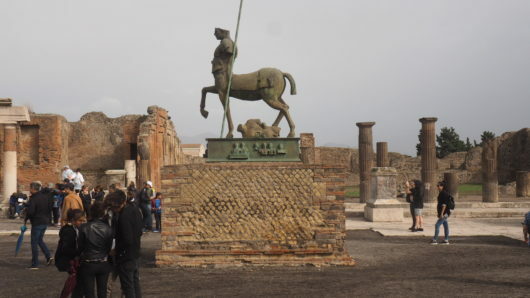 Pompeii is famous as it is a city that was decimated and buried due to a volcanic eruption of Mount Vesuvius in AD 79. Many of the inhabitants living there were not able to escape this disastrous event. Because of this history, it has been one of the most popular tourist attractions in Italy to this day. If one had to find an example for the word idyllic, Capri Island would be the perfect example. It exudes every aspect of the definition of idyllic – extremely happy, peaceful, and picturesque. Prior to arriving on this island, I had no expectations whatsoever on how Capri Island would look like. Fast forward, and now I’m eager to return to Capri Island. Unlike most other places on this trip, such as Naples, Positano, and Amalfi, Capri Island deserves a minimum of two days to fully appreciate the whole of the island leisurely. For us, we were there early in the morning all the way till the afternoon of the next day. For those that are making it just a day trip – don’t! The time spent here is worth so much more, and here I will tell you what exactly to do to enjoy both the touristy and non touristy aspects of this gorgeous heaven. First of, we were fortunate enough to have our accommodation host Fabio, who mentioned that he was some sort of President of Capri Island’s council or something like that. He gave us a map and meticulously presented to us the best things to do on the island, and therefore we were able to venture into some sightseeing that often most tourists would ignore. I must also say that we were very blessed as the weather on the first day we were in Capri Island was perfect, as you will see below in my many many photos. When life gives you lemons, make lemonade, and there’s no better place to find both lemons and happiness in Sorrento! Famous for its lemons, the size of these Sorrento lemons are practically as big as baseballs. 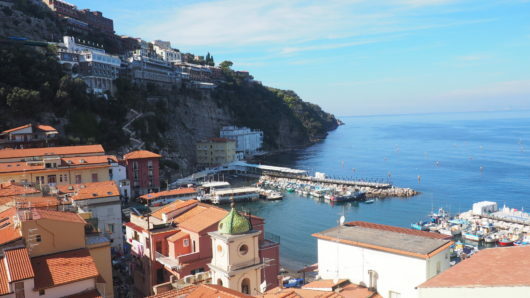 Of all the places near or considered part of Amalfi Cost (Sorrento/Positano/Praiano/Amalfi), Sorrento remains to be the newest and most modern area of them all. The roads are easier to drive, the architecture and surroundings feel newer, and everything seems cleaner. That said, you can pretty much explore the major areas of Sorrento within a day, and most of the stores are quite similar – island wear clothing, tourist shops selling anything lemon related like limoncello (Italian lemon liquer) or porcelain designed with lemons on them, and random art pieces.